Alex Grinch, defensive coordinator, coaches at Washington State University Thursday, March 31, 2016. Washington State’s defeat to Colorado last weekend left defensive coordinator Alex Grinch deeply disappointed – in himself, and in his players. Not because they lost the game, but because for the first time in his two seasons at WSU, Grinch got to the end of the game film thinking that his players hadn’t given him the level of effort they’d shown all season long. “We’ve had issues with execution before – that’s not unique to us, it’s part of the sport. But this was the first time since I’ve been here that I cannot say we played with the effort necessary to win a Pac-12 football game,” Grinch said. “And it certainly doesn’t mean we laid down or anything. But there’s a certain standard you have to play with. “We have to point fingers at ourselves first – we didn’t prepare the guys enough to play and win a football game. Our brand of football was not evident on that video from beginning to end. Yes, WSU’s defense made a poor showing in the Colorado game, allowing more than 600 yards for the first time since the season opener. But that Grinch can now reference “our brand of football” when dissecting this defense is in itself a testament to how far the Cougars’ defense has come in his two years in Pullman. WSU is by no means a top-10 defensive powerhouse yet, but there are signs now that the Cougars have found an identity on that side of the ball and are aspiring to greater things. Despite giving up a season-high 258 rushing yards and five rushing touchdowns against Colorado last week, the Cougars head into Friday’s Apple Cup against UW with the No. 1 rush defense in the Pac-12, allowing an averaging of 129.7 yards per game, and they rank 24th nationally in turnovers, with 21 so far. WSU has allowed 25.5 points per game this season – down from 27.7 in 2015, and 38.6 in 2014 under Mike Breske. In other words, the Cougars are giving up an average of two fewer touchdowns per game than they were two years ago. The Cougars had only eight turnovers in 2014, but now, for the second year in a row, WSU’s defense has forced more than 20 turnovers. They finished with 24 last season and are on pace to surpass that if they fulfill Grinch’s “two turnovers per game” mantra. WSU is 13-3 when forcing multiple turnovers per game in the Grinch era. Last week against Colorado, they had only one. The odds prevailed and WSU lost the game. But as Grinch would say, he can live with losses if his players play up to the standard he’s set, and the standard WSU has adopted as its benchmark this season. “That’s why I point to playing at extreme effort level. Things like, when you have a chance to get a tackle for loss on short yardage stop, the ball carrier doesn’t fall forward for a 2-yard gain, or, when you have a chance to sack the quarterback, you sack him,” Grinch said. “They got the message Sunday, and they continue to get that message each day. It sounds basic, but extreme effort is the cornerstone of Grinch’s brand of defense, which emphasizes takeaways and takes on the aggressive flavor of the defense the Seattle Seahawks play under Pete Carroll. That’s what Grinch is going for anyway. To give the Cougars something to aspire to, Grinch shows the team NFL film from sometimes and is such a student of defense that he watches some of what UW and Colorado do on defense every week just because he admires the work of Colorado defensive coordinator Jim Leavitt and UW defensive coordinator Pete Kwiatkowski. Grinch’s emphasis on takeaways is a holdover from his Missouri days where he worked under former Tigers defensive coordinator Dave Steckel, who, Grinch says, also took some of his philosophy from Carroll. Steckel’s 2013 Missouri defense ranked fifth nationally interceptions (20) and eighth in turnovers forced (32). In 2014, the Tigers led the SEC in total defense and ranked 23rd nationally in total defense. 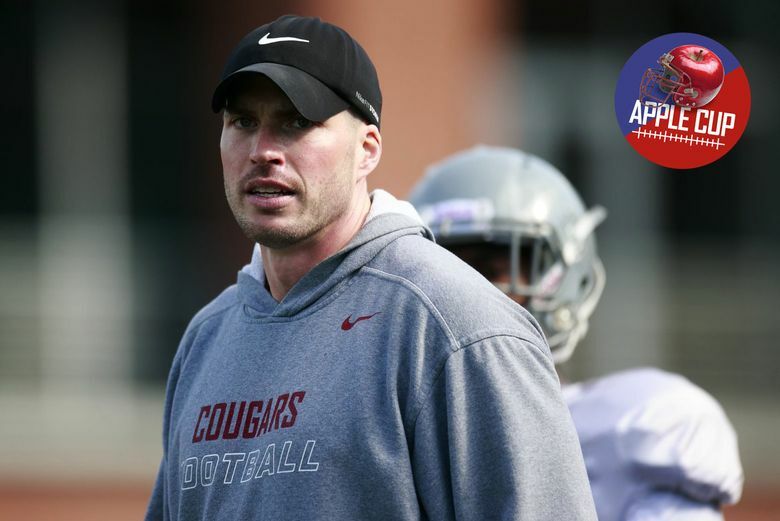 So when Grinch, 36, came to WSU in 2015 as a first-time defensive coordinator, he implemented what he’d learned from Steckel, while cultivating a defensive identity for the Cougars. Thus, WSU’s “Speed D” was born. One tradition Grinch started: “When we get a takeaway, we throw a fist up to remind each other how important those things are,” Grinch said. Grinch also realized that having proof to back up his philosophies on the importance of takeaways would help sell his defense to his new players. So before last season, he compiled 2014 stats from all FBS programs to find out if there’s any correlation between defensive takeaways and success. By those numbers, the Cougars are three takeaways shy of nine wins. Last week’s performance didn’t help much, but the other thing Grinch has proved very good at is motivating his troops. Grinch says he read that in a book – though he can’t remember which one – and it resonated with him immediately. That’s one Grinchism the Cougars will keep in the forefront of their minds all week as they prepare for the biggest Apple Cup this state has seen in decades.